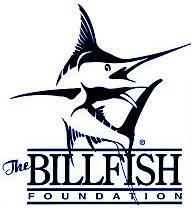 You are here: Home / Fishing Records / Fiji National Line Class Records / Bite Me Smashes Ladies World Record Wahoo! Fiona Stallard and her partner Mark Lacey were staying at Matava Eco-Adventure Resort on Kadavu Island, Fiji. There to enjoy some diving, snorkeling and a week of relaxation in the warm Fiji Islands tropical sunshine. 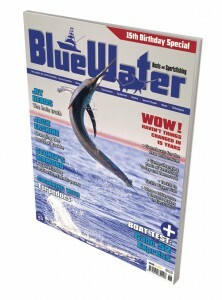 Every evening, Australian anglers Graeme McKinnell and Owen Spalding, then fishing aboard the resorts charterboat ‘Bite Me’, would entertain all the guests with tales of their days light tackle exploits. 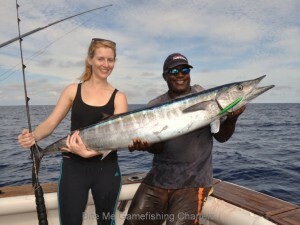 When Owen returned one evening with a new M-10 Barracuda Fiji National Record and colourful stories of leaping wahoo packs, Mark and Fiona decided have a go and see for themselves. Plans were set and soon we were heading out. By lunch time, with several nice wahoo and dolphinfish on deck, dinner was secured so I invited them to try a little record hunting. Conditions were ideal and Mark & Fiona were keen to have a go…. Fiona first landed a wahoo on 8kg with no problem at all so we went one step further and broke out the ultra-light tackle, Avet SX reels on Stickfacewrangler custom rods hand made for Bite Me by Glen Gardener in Sydney. Our prefered set-up, a short double, a 14ft Platypus 80lb leader and single strand wire bite leader terminating in the wahoo’s favourite snack, a Halco Laser-Pro…. At 2.55pm both rods loaded up and line melted off the reels as a pair of wahoo streaked across the surface. 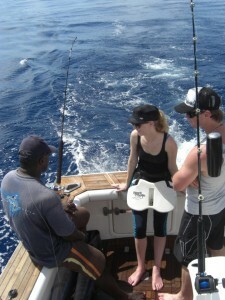 Fiona’s fish settled down and cruised out wide but Mark’s fish headed down under the boat. 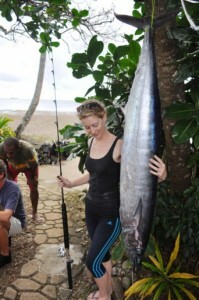 With 1kg of fighting drag and a green fish, all Fiona could do for now was to keep the rod tip high and loaded up. After 10 minutes Mark almost had his fish to the boat but just as we saw colour a shark pounced and ended the fight. Not a record fish but would have been an excellent catch on 3kg. Still, now Mark could pick up the video camera we were able to chase down Fiona’s fish that still cruised away from us on the surface heading for open water. A battle ensued with Bite Me charging backwards across the calm waters and Fiona cranking on every inch of line she could as the wahoo made the fatal mistake of staying on the surface. At 3.18pm, 23 minutes after hook-up, deckie Joeli Tuku, standing on the marlin board of a hard charging Bite Me, stretched out, grabbed the flimsy leader and gaffed the fish. 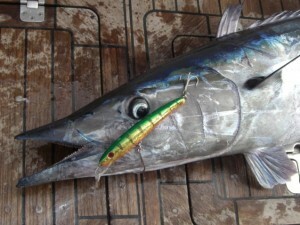 Whoops of delight, high fives all round and a new pending W-03 World Record Wahoo hit the deck. 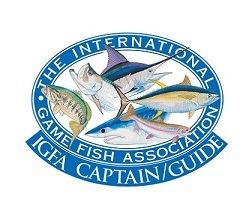 Later, back at the resort, (an IGFA Weighstation) the wahoo weighed in at 21.0kg on the certified scales.